Up for review today is Debonaire House Daybreak. Daybreak is the third line in Debonaire House’s portfolio after the Habano and Maduro lines. Apparently, the idea behind the three lines is for the cigar smoker to have a Debonaire for each part of the day: morning, afternoon, and evening. The Debonaire Toro is an impressive looking cigar. The outer wrapper is seamless and extremely smooth. The band, a mix of gold, black, and white, does a great job of getting my attention with the brand name. Below the name, the band states “Ultra Premium.” I’m curious to find out just how much this cigar lives up to that statement. After applying a straight cut, I test the draw. It’s a touch more restrictive than I would normally like, but brings nice flavors of earth, light cocoa, and a touch of spice with it. The smell off of the foot is very strong and quite good, with strong spiciness, cedar, vanilla, and most of all, almonds. I’m excited to light up. The opening of the Debonaire Toro is not at all what I expect. After smelling the foot, I had anticipated a strong, spicy blast on opening. Instead, the cigar kicks off with lush, mild bodied, medium strength smoke. It’s really, really good. The flavor profile hangs together incredibly well, with loads of cream, almonds, freshly baked bread, and some peanuts on the nose. The smoke is so light, I can retrohale a full draw out my nose with no discernible heat or pepper. The finish as well is extremely clean. For a mid-afternoon cigar, this is heaven. At an inch in, the cigar is producing incredible amounts of smoke, has a perfect burn, and no detectable flaws in the construction. At this point, I’m impressed, but now I’m looking for a bit more flavor and strength. As the second third starts, the strength increases just a bit, bringing the body up to just above mild and the strength to below medium. The flavor profile itself hasn’t changed much, adding a nice oak note. Still, it’s remarkable how balanced the sweet, salty, and creamy flavors are. At no point during the smoke up to this point has any one element of the profile dominated the rest. Note: that’s not the same as saying all of the flavors just blended together. They remain distinct, but without one dominating the rest. That’s quite a feat, and not something I encounter with most cigars. In the final third, seemingly at my request, the flavor profile shifts considerably and in a great way. The bread notes sweeten into something like vanilla cake dough, with a really nice pepper added on the retrohale. In terms of complexity and flavor development, it’s exactly what I would have liked to see in the final twenty or so minutes of this cigar. If Debonaire House set out to create the perfect morning smoke, they aren’t far off the mark with Daybreak. It performs wonderfully from a construction standpoint, requiring just one minor touchup and delivering loads of rich smoke. 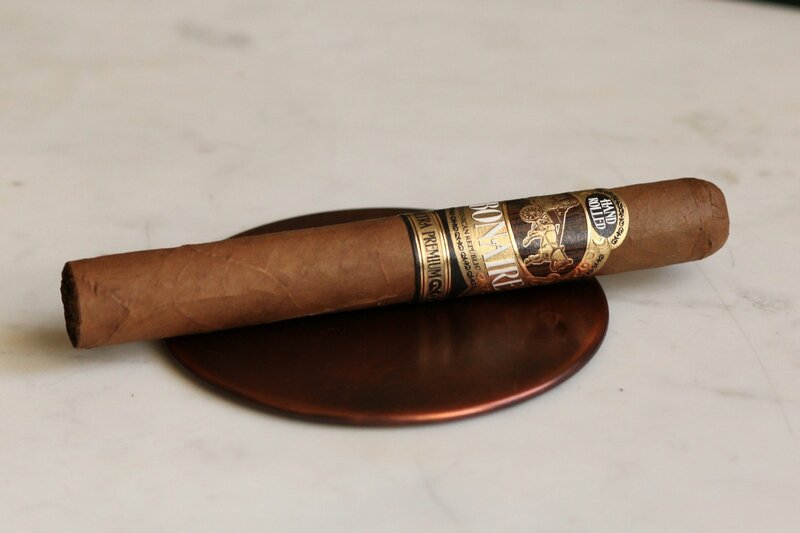 Throughout the course of the cigar, it remains squarely in the mild spectrum of strength and body, but delivers great flavors that harmonize well with each other. All this does raise the question in my mind of whether other vitolas of this blend would fare as well, but in my opinion the Toro size is one I can wholeheartedly recommend and will absolutely be in my regular lineup.